The consumerization of IT is turning traditional ways of working and technology selection on its head. 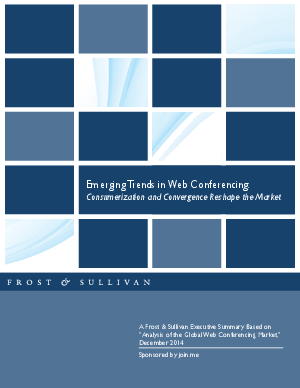 In web conferencing, emerging technology trends continue to reshape the market. Web conferencing users as well as line of business heads are discovering simpler and more effective options for collaboration, triggering greater adoption of cutting edge technologies in their workplace. Download this paper to discover how emerging trends are transforming web collaboration and how you can leverage the latest technologies to have a faster, more user friendly, and cost effective experience.